Hoopers. Rappers. Gang members. Drug dealers. These are all words that stereotype Black men. And yes, there are black men who are those things. But, the message one group is trying to show is that black men are much more than that. New Narratives performed at the Truth and Transformation conference and received a loud standing ovation. 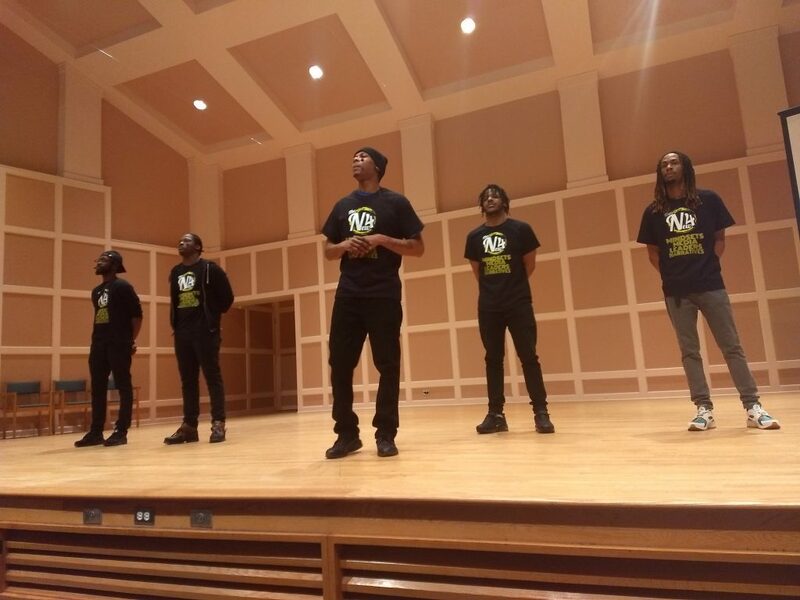 The New Narratives group are Twin Cities black men, also known as Individuals with Dreams (IWD), who are combating often-times one-sided and harmful narratives of their community. “We are a collective of entrepreneurs and artists who strive to uplift the community through creative expression and outreach,” said Lewis McCaleb, who also goes by Lewiee Blaze. Blaze and a half dozen of his friends and business partners were invited to perform on day two of the Truth and Transformation: Changing Racial Narratives in Media conference on March 20 at Hamline University. The conference was put on by six community groups including The Minnesota Humanities Center, Minnesota Public Radio, KMOJ, Pillsbury United Communities, Hamline University, and ThreeSixty Journalism at the University of St. Thomas. The group received a $332,000 grant from Saint Paul & Minnesota Foundations through the Truth, Racial Healing and Transformation project of the W. K. Kellogg Foundation aimed at helping news professionals uncover their own biases and assumptions and address the issue of problematic or absent narratives in the media related to communities of color. Fitting because the members of Individuals with Dreams say the media has work to do to better and more accurately portray their stories. IWD’s mission is simple. These young black men want to tell their own stories about who they are. They are: landscapers, photographers, entrepreneurs, educators, mechanics, and storytellers. “A lot of what I do is really foster trust, foster voids, foster others and really build spaces for people to come together and learn from one another and build healthy relationships,” said Blaze. IWD is currently taking their message on tour locally to high schools, college campuses and theaters with the hopes to share their dreams around the country one day.